Many employers in Ontario use a probationary period to assess the suitability of a new hire. Contracts of employment will often stipulate that employees may be dismissed with or without notice, with or without cause during their probationary periods. Since the Employment Standards Act, 2000 (the “ESA”) states that employees with less than three months of service are not entitled to any notice of termination or pay in lieu of notice, employers might be tempted to assume that any employee who is dismissed during her contractual probationary period is not entitled to any notice of termination. A recent decision of the Ontario Small Claims Court calls this practice into doubt. In Cao v. SBLR LLP, the court considered a claim for pay in lieu of notice of termination by Suyi Cao, an accountant employed by SBLR LLP for just over a month. At the time Cao was hired, she signed an offer letter which provided for a 90 day probationary period. She was also provided with a copy of the SBLR LLP employee manual, which indicated that employees who were experiencing performance issues would be asked to attend meetings to discuss their performance and would be given suggestions for improvement. Approximately one month into her employment with SBLR LLP, Cao was notified that her employment was being terminated. She was advised in that meeting that she was not performing at the level required by SBLR LLP and that the company needed her to obtain her Certified General Accountant (CGA) designation by the following summer, which she had advised was impossible due the course schedule. It should be noted that Cao’s offer of employment made no reference to the CGA designation. At trial, SBLR LLP alleged that it had just cause to terminate Cao because she had represented to the company that she would complete her CGA courses by the summer of 2009 when, in fact, she would not be in a position to do so and, further, because she had misled SBLR LLP regarding her experience with preparing T2 tax returns. Cao testified that the termination meeting was the first time she had been given any negative feedback about her work. The termination letter did not allege just cause for her dismissal and her Record of Employment indicated that she had been “terminated involuntarily without cause”. Cao was not provided with any pay in lieu of notice of termination. The deputy judge rejected the just cause allegations, finding that the defendant had no evidence Cao had misled the company about any of her abilities or the anticipated completion of her CGA designation. The deputy judge then turned to the question of whether or not the plaintiff could be dismissed during the probationary period without notice or pay in lieu of notice. 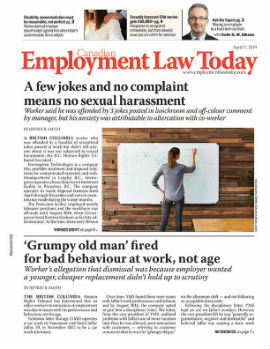 The deputy judge held that employers who dismiss any employee during the probationary period are bound to act “fairly and with reasonable diligence” in determining whether or not the proposed employee is suitable to the job. Further, the probationary employee must be given a reasonable opportunity to demonstrate his or her ability to meet the standards of the employer. Since the defendant had led no evidence at trial supporting its conclusion Cao was unable to perform the requirements of her job and could not demonstrate to the court Cao had been given a fair opportunity to respond to the alleged concerns regarding her performance. The deputy judge concluded that SBLR LLP did not have just cause to terminate Cao’s employment and, further, that it had terminated her during the probationary period in bad faith. Accordingly, Cao was entitled to common law notice of termination, which the deputy judge fixed at four months. Although this is a decision of the Small Claims Court and thus may not be given a great deal of weight by Superior Court judges, there are certain lessons that can be taken from the ruling. First, although the contract between Cao and SBLR LLP had a probationary period, the agreement did not state specifically that Cao would not receive any notice of termination if she was let go during the probationary period and it did not refer at all to the minimum standards prescribed by the ESA. Including such language in the contract would have given SBLR LLP a better defence against Cao’s claim for common law notice of termination. Second, the deputy judge placed a great deal of emphasis on the section of the employee manual that told employees they would be given opportunities to improve poor performance. Employers must always follow their own policies and procedures as the Courts view these documents as promises you have made to your employees. If you fail to honour your own policies when dealing with employees you are at risk of being found to have acted in bad faith. Third, if there are particular qualifications, skills or professional designations that you believe are essential to a job, it is advisable to refer to them in both the job posting and the offer letter. You may also wish to make the offer of employment conditional upon the applicant confirming that they do, in fact, possess the qualifications referred to in their resume. This decision illustrates the risk of failing to communicate with your employees at all stages of the employment relationship, from hiring to firing. If Cao’s employer had clearly communicated its expectations regarding her CGA designation on hiring, had met with her during the employment relationship to communicate its concerns and then implemented the termination only after she failed to address such concerns, it is unlikely that there would have been a finding of bad faith and the company would have been in a far better position to support its just cause position. It’s also important to remember that just inserting a reference to a probationary period may not be sufficient to preclude a claim for common law notice of termination during the first three months of employment. • Cao v. SBLR LLP, 2012 CarswellOnt 9184 (Ont. S.C.J.). Laurie Jessome practices employment law with Cassels Brock in Toronto. She can be reached at (416) 642-7474 or ljessome@CasselsBrock.com.